Park opens at 7 a.m. daily, year round. Closing time is 8:30 through April 29; 9 p.m. April 30-June 10; and 9:30 p.m. June 11-July 15. This 18-hole disc golf course, located near the Eatontown Boulevard (Rt. 537) entrance of the park, is open during regular park hours. 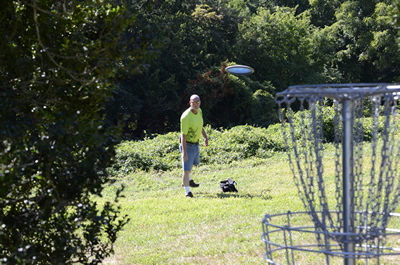 Played much like traditional golf, disc golf uses a flying disc that is thrown from paver brick “tee” pad toward an elevated metal basket located at the end of a fairway. This course is fun for beginners, yet still challenging for experienced disc golfers. Players are invited to bring their own disc and enjoy this course for free. Scorecards are available at the first tee and include basic instructions and rules. Download a scorecard. The course was designed by Carl “Cubby’ Cubbedge, a registered disc golf player with the Professional Disc Golf Association. The disc golf baskets were donated by the Friends of the Parks. The Park System recently added six benches along the Disc Golf Course. The park is being developed with active recreation in mind and offers open areas and two softball fields. The ball fields and disc golf course are available for rental. Learn more about field rentals. Wolf Hill is also home to one of two Off-Leash Dog Areas operated by the Monmouth County Park System. 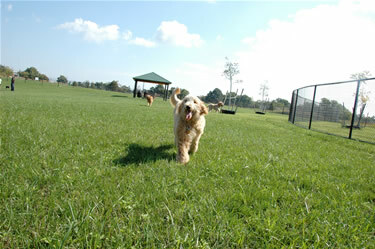 This 4-acre area combines an area for dogs of all sizes as well as an area for dogs weighing 35 lbs. or less. Dog waste bags and garbage cans can be found in both dog areas and there are portable toilets near the parking lot. At present, there is no water source available at the site for dogs and owners. A complete list of the regulations concerning the Off-Leash Dog Area is available here and is also posted at the facility. Garden State Parkway to Exit 105, Hwy. 36 East to County Route 537/Broadway Avenue & use jughandle to cross back over 36 onto 537 West. Continue over Hwy 36 and turn right onto Crescent Place. Main parking lot is on the left. Continue east on Crescent Place for the Off-Leash Dog Area and parking is on the left.